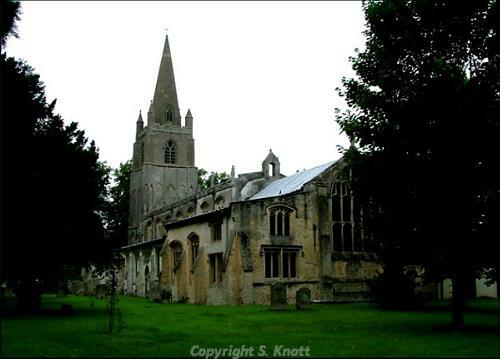 This superb church has a very fine late Norman nave and chancel with arcades. The tower dates to the mid 13th century but has been altered. The roofs, clerestory and east window are Perpendicular and were possibly added when the south chapel was rebuilt in 1536. The north aisle and chapel were altered at similar date. Inside, there is a font dating to 1544 and various fine benches and tombs. A watching brief in March 2010 revealed a sequence of subsoil, a medieval pier base and post-medieval air ducts and pew supports during the removal of overburden within the north aisle prior to the insertion of a new floor. Finds from the investigation included medieval and post-medieval brick and floor tile and an 18th century clay pipe. Very fine late Norman nave and chancel with arcades. Mid 13th century tower and alterations. Windows, doors etc. 14th century. Roofs and celestory and east window Perpendicular, possibly same date as rebuilding of south chapel 1536. North aisle and chapel altered at similar date. Font dated 1544. Benches, tombs etc. E. Rose (NAU) 23 May 1988. Details and press cutting in file. Record of areas in nave where floors removed. E. Rose (NLA) 5 February 2003. Visit to discuss conversion of north chapel to a hall. Further notes on building (S2) in file. E. Rose (NLA) 4 May 2005. The earliest deposit encountered appeared to be a former subsoil and probably predates the construction of the north aisle but it is also possible that this could be a dumped deposit and could mask earlier levels associated with the 14th century aisle or an earlier 12th century predecessor. A medieval pier plinth was partly exposed inserted into this early deposit. Air ducts and pew supports likely to be of post-medieval date were also recovered and above this was a broadly contemporary tiled floor. Finds from the investigation included medieval and post-medieval brick and floor tile and an 18th century clay pipe. S. Howard (NLA), 19 August 2010. --- Unpublished document: Baggs, A.P.. 2003. Notes and photographs. --- (No record type): Clarke, R. R. and NCM Staff. 1933-1973. Norwich Castle Museum Record Card - Medieval. Walsoken. <S1> Article in serial: Clapham. 1934. Vol II, p 129. p 129. <S2> Unpublished document: Rose, E.. 2005. Addendum to Building Report. <S3> Unpublished document: Cope-Faulkner, P.. 2010. Archaeological project Services Report No. 35/10. Archaeological watching brief at All Saints' Church, Walsoken, Norfolk.. May.